We had a few trees taken down on our property a few weeks ago. Nine in all -- four fir, two cottonwood, two paulonia, and one maple. It was a very impressive sight, watching them climb up the trees, limbing on the way up, then taking the trunk down in sections. All done in one day, including clean-up, chipping all the branches, and cutting the trunks into lengths for firewood. The chipper was rather intimidating -- a tow-behind model that took the entire cottonwood trees, from 8" diameter trunk to every small branch, chewed them up and spit them out into the back of a truck. We also had them leave the chips for us to use. It's quite a large ridge alongside our shed. But that also left a very large pile of firewood sections for me to split and stack. I literally had my work cut out for me. We've been working at it a little bit at a time, an hour or a little more here and there, progress. I started out just using an axe. Something that I inherited from my father, it's fairly old, and the head slowly creeps towards the end of the wooden handle. I need to either get a new one with a fiberglass handle, or get a new wood handle installed on this one. But in any case, I got some of the paulonia done with just that axe. The fir, though, was a totally different story. The axe just bounced off, making small marks on the rounds, but nothing in the way of cracks through the wood. I needed something more aggressive. My wife, bless her, was all for renting a hydraulic splitter. I'm a hands-on kind of guy. I build my bikes by hand, and prefer hand saws to electric skilsaws. Maybe I'm just an anachronism. Splitting wood is about the maul. Part wedge, part axe, heavy, effective, and most importantly, manually operated. I have the head from one that has traveled with me for almost 30 years through several moves, the handle long since lost to use. split firewood -- at least manually. 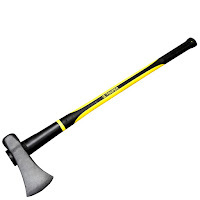 So my wife picked up a new splitting maul from the local hardware store, a nice fiberglass handled model, with yellow rubber grips, all shiny black and sharp. I started in on the stacks of fir rounds. 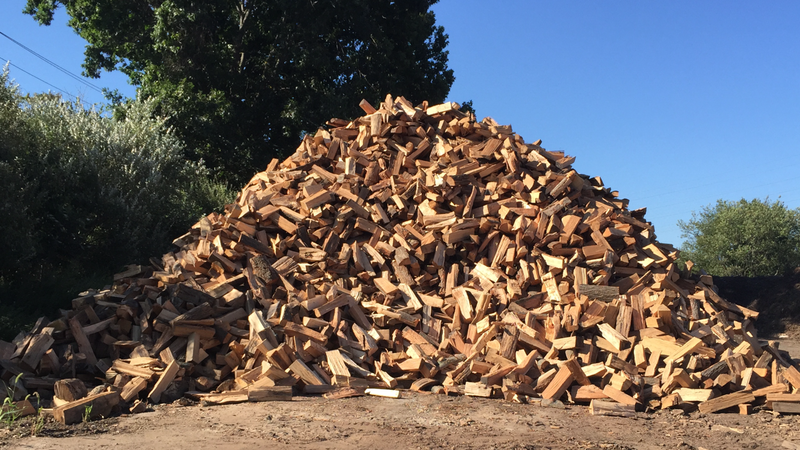 The familiar heft, a quick heave, and the satisfying sound of the wood fibers separating. Slowly, the rounds became pie-shaped pieces (well, if the pie were 18" in diameter and 14" tall) suitable for the wood stove. It's kind of cathartic. Mentally, it takes me back to fall and winter days with my father, cutting and splitting firewood. Sometimes we would sell a few cords, sometimes it would be kept to feed the wood stove in the basement. We had a running joke when it came to splitting the wood. "No, because I never strike twice in the same place." It's getting better, the aim and control of the maul. It's been a lot of years since I've swung one. And my wife even recognizes the satisfaction of a good workout and seeing the wood getting split. A couple weeks back I posted about the Vicious Cycles Gran Fondo I had ridden in Ellensburg. I also mentioned that I was providing mechanical support for the BuDu Racing Moses Lake Triathlon the day before. Far and away the most requested service was use of the floor pump, whether they wanted to wield it themselves or asking me to do so. In fact, I think there was only one person that wanted me to do anything besides air up their tires, and that was replacing an inner tube (which then needed to be pumped up). Just a little topping-off to be ride-ready, I asked what they usually ran in their tires. I'd look at them, look at the tires, and sometimes ask them why they were running the pressure so high. All they were accomplishing is rattling their teeth out. I get it. Really. It makes sense that a firm (or in this case rock hard) tire is a faster tire. And if that tire is rolling on glass, or as near as you can get on a road equivalent, then yes, generally a firmer tire will exhibit lower rolling resistance. It will also slide easier, and transmit less torque. But that's only an issue if you turn, hit the brakes, or want to accelerate. Not a lot of call for those shenanigans in a triathlon. The facts are that the tire, in real world conditions, rolls faster when it's not so firm. And the rougher the surface (within reason -- we're talking about road surfaces here), the lower the pressure desired. And as the tire carcass gets larger (as in a wider tire), the need for higher pressure to avoid a pinch flat (where the tire bottoms out on the rim when hitting a sharp object such as the rim of a pothole). It's a balancing act of enough pressure to protect the tube (and as the rider/bike weight increases, so does the required pressure) and comfort. For standard road bike tires of 23mm width, 100 psi is plenty. I routinely run mine at 90-95. For 28mm tires, 85 is considered fairly high. That number printed on the side of the tire is the recommended MAXIMUM pressure, to avoid the tire blowing off the rim. There's really only one word that describes this ride. Brutal. Details to follow. 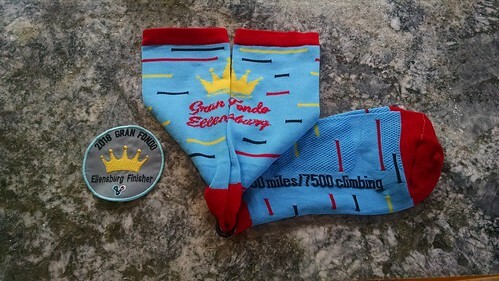 The Gran Fondo Ellensburg is a lollipop shaped (mostly) ride of 92 miles, with a few thousand feet of elevation gain thrown in for your thigh-sapping pleasure. This is the fourth of five Gran Fondo rides on the Vicious Cycle calendar, and only the second in which I've participated. The last was the Gran Fondo Leavenworth in 2013. And I was better prepared for that one (on top of being five years younger). 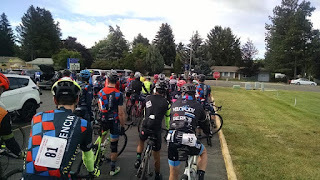 The weekend started on Friday for me, with a drive over to Moses Lake for an overnight stay and then mechanical support at the BuDu Racing Moses Lake Triathlon. I was also there to display and promote Mjolnir Cycles (my brand) and Cirrus Cycles Kinekt seatpost. After that event I hung around town for a short while, then drove about 2/3 of the way to Ellensburg, staying the night in Vantage, right on the Columbia River. I took a short shake-out spin on the bike, and happened to cross paths with one of the riders from my Elbe Multi-Strada Loop Ride participants. They had ridden over from Ellensburg and were camping the night in Vantage. They had the advantage of a stiff tailwind (that turned into gale-force winds lasting through the night), and were praying it died out by the next day (didn't happen, and I hope they didn't get blown into the river during the night). 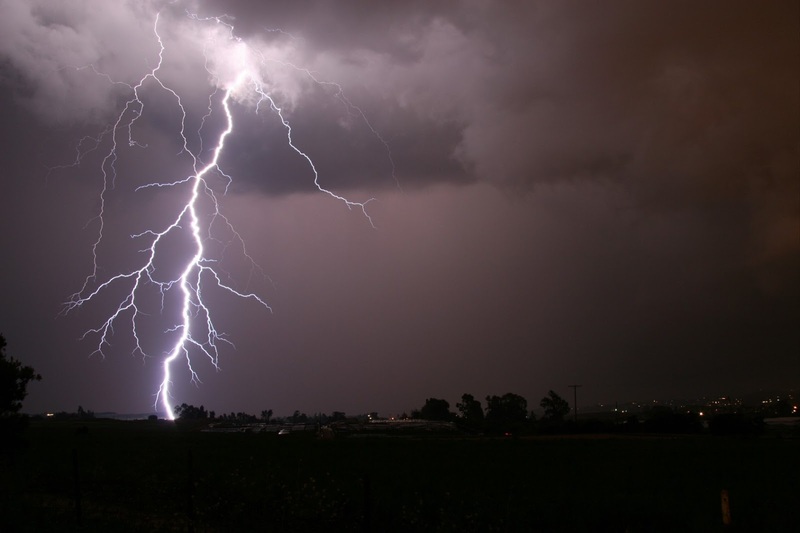 After a dinner at the only eatery, I settled into my room to watch some Sci-Fi channel and TBS before turning in for the night, being woken several times by the wind. Up early, I put down a little food before hitting the road for Ellensburg, stopping for fuel (for my car and me) within spitting distance of the course start at Mt Stuart Elementary School. Warm-ups are really not needed with an event like this. A neutral roll-out keeps things together and allows every one a chance to get in the groove before the lead truck pulls off. Then it's game on. Only we had another 25 miles into a stiff headwind. No one wanted to keep their nose up front for long, so things stayed mostly calm. There was an interesting phenomenon, though -- an ever-present fear of losing the pack and having to push into that wind alone. So there were several surges from the back, and about 20 miles in there was finally a split in the pack. On a downhill. All it takes is two people letting the gap open for this to happen. But I wasn't in this event to race. The pointy end of the fondo scene is VERY sharp, and my days of knocking elbows with these guys is long past. I'm fine with that. 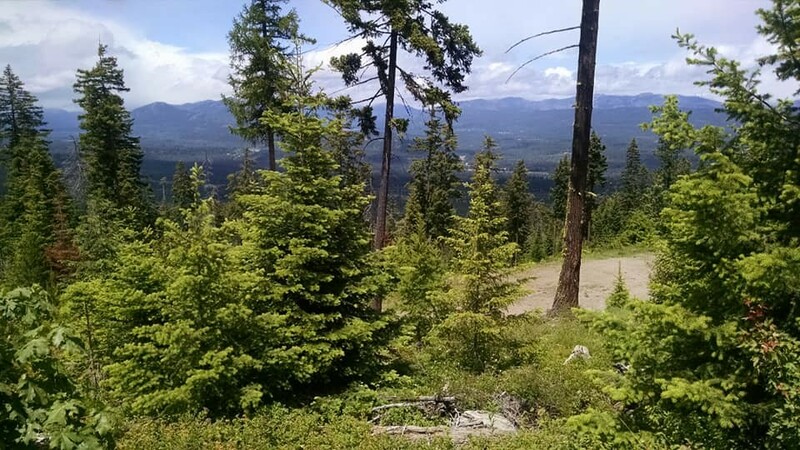 I found myself in the second pack as we entered Cle Elum, and headed into the hills. I utilized the first food stop to use a port-o-potty, and everything was mostly alone or with just a few others from that point to the end. Really, though, this is where the riding starts. At least what matters on a ride like this -- GRAVEL. Usually gravel roads that are steep. And this course had such aplenty. The next 6 miles gained nearly 2600 feet, with pitches over 20%. Yes, I had to walk a couple of them. And I didn't lose much time at all to those who were still on their bike rather than pushing. By the time we got to the top, there was sleety stuff falling from the sky. Not much, but enough to say we got snow. In June. Yes, it was cold enough. Then a bone chilling descent, another climb, another descent, etc. Lather, rinse, repeat. Fortunately these descents were fairly smooth, which allowed one to let go of the brakes and fly for short periods. Lots of fun. Almost makes all the work of going uphill worth it. 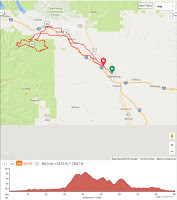 I kept watching the ride distance, trying to calculate in an increasingly fuzzy brain just how far it was until the last rest stop and the return to pavement (and a merciful tailwind). I thought I had it all worked out when I came to the food area, volunteers offering to fill my water bottles. I said, "So, it's all downhill and with the wind from here, right?" "Yep, after that 1000 foot climb it's all downhill." I knew he wasn't kidding. Yep, five more miles of dirt, with a long somewhat steady uphill thrown in. The back side of this one was not so smooth, though. The bane of gravel riding, at least to me, is the washboard that is developed in the road surface from cars and trucks going into corners (I blame the proliferation of anti-lock brakes), which becomes a dangerous back-and-forth whipping on a bike at any appreciable speed. Two-wheel drifts result, and one can't be on the front brake or there is the very real risk of sliding out, locking the front wheel, or just going off the road entirely. Or any combination of those. Even when successfully negotiated, it's not comfortable at all. I survived it, but had to stop along the way to give my neck a break. The dilemma of these events is that the real challenge, the actual draw, is the gravel. Getting off the pavement and into something more primal, with less traffic. It's about you against the chosen route, even if you're not at the pointy end of the race where it's as much you vs. route as it is you vs. other riders. Once you get past the top 10 placings, there's more of a cooperative effort. Maybe it's the shared suffering. A paceline 6 strong passed me, and I latched onto the caboose position for a nice stretch of speeds in the upper 20's and low 30's. Unfortunately I really didn't have the legs to stay with it after a couple of uphills, and found myself pushing on alone for the last 10 miles. I kept a mental count-down of the distance, the last of which were on the Iron Horse Trail. Nicely traffic-free, but the surface was loose and required more concentration than I was wanting to put forth. And finally the finish. Seemed a little anti-climactic, crossing between two orange cones with one person writing down numbers, and another passing out the finisher's patches. Where's the brass band and ticker-tape? After over 6 hours in the saddle, how about a little love? I cruised the last three miles back to the school, propped my bike against the truck, and climbed in to change out of my riding clothes. And the skies chose that moment to open up. 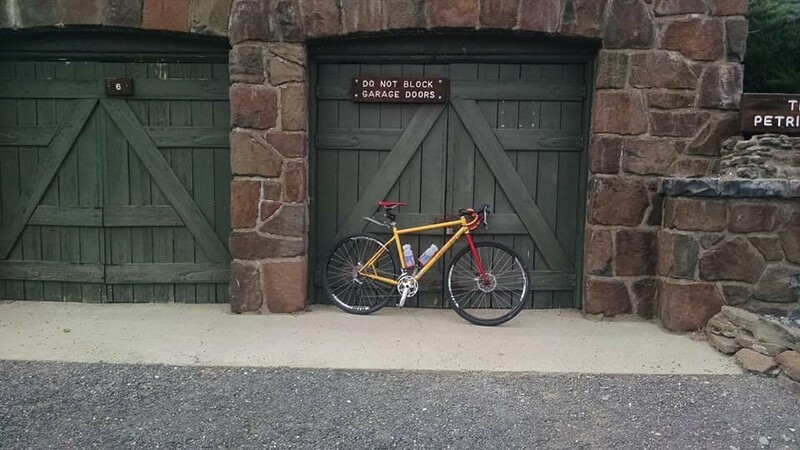 I waited it out before putting the bike away and venturing over to get my post-ride burrito. Barely able to walk, and with mental capacities not quite 100%, I stared at the can of Coke in one hand, the burrito in the other, and decided to get back in my truck to eat. And then the skies opened up again. I really felt for anyone still out there on the course, hopefully off the hills by that time. I waited around a little while longer, than took the 3+ hour drive home. Gotta love Snoqualmie Pass traffic on a late Sunday afternoon. So now it's Tuesday, and I think my legs have recovered enough so that walking looks normal, and I can ride a bike uphill without crying. Checking the results, I ended up 45th out of 101 male finishers (one lady finished just under 6 minutes ahead of me -- she was in that paceline that I briefly picked up on the return tailwind section). My final official time was 6:45:28, only an hour and 20 minutes behind the event winner... So that's not all that bad. I remember the Leavenworth ride making me feel like I'd done the hardest ride of my life. I think this tops it. 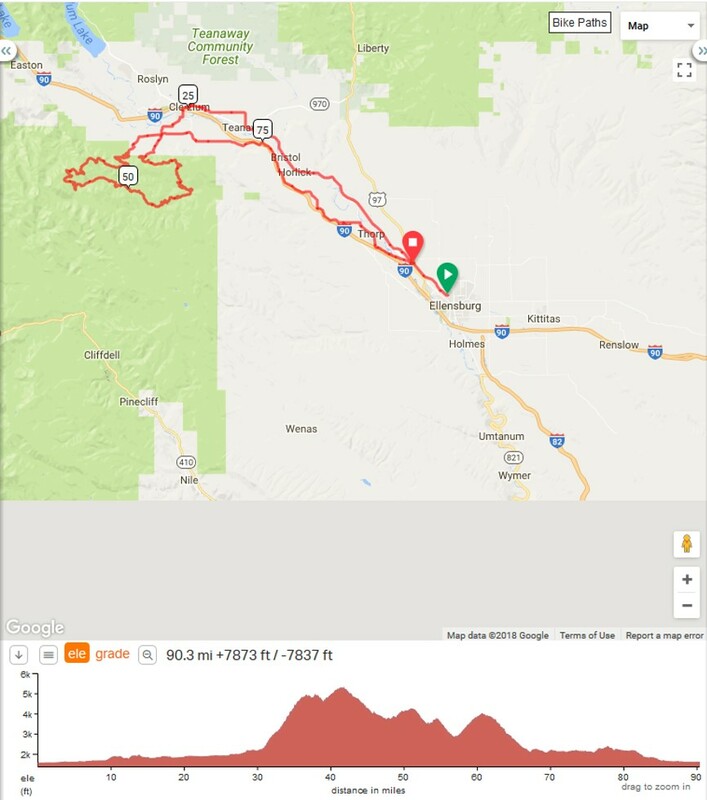 Yes, I have myself to blame for my longest ride leading up to this one only being a tick under 4 hours. And my nutrition and hydration definitely weren't on point. I made the entire ride on 8 Fig Newtons, 1 chocolate chip cookie, and probably just under 4 large water bottles full of only water. The mind wanders to figuring out how I could do better. Maybe I've gotten these epic rides out of my system.